Wow I’m on a roll today, two posts in one day. And I’m actually blogging about my card before the entries close to this challenge. This weeks CASEing the Catty Sunday Challenge is Cupcakes & Carousels pages 8-13 of the Occasions Catalogue. I have chosen to CASE the “Celebrate” card on page 11 of the Occasions Catalogue. I’ve silver heat embossed a Lace Doily from the Occasions Catty. I just love how it turned out. I’ve also used bolder colours with Flirty Flamingo and Dapper Denim. 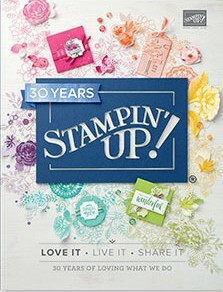 I’ve used the So In Love stamp set to stamp the background and the Lift Me Up stamp set for the sentiment. This card even has the paw of approval from my trusty assistant Marvi. I’d love you to click on this link and like my card. Here is my entry to last weeks CASEing the Catty Sunday Challenge. We could case anything from the Sale-a-bration Catalogue. 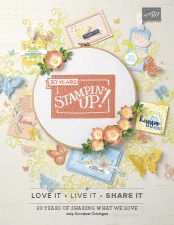 Spend $90 on anything from Stampin’ Up! and you can choose a free product from the Sale-a-Bration Catalogue. Who doesn’t like free things? I chose to CASE the “Thanks” card from page 6 of the Sale-a-Bration Catalogue. I liked the squares made from Carried Away DSP. I didn’t have any of this paper so I improvised. Here’s my version using the Delicate Details stamp set, which is free with any $90 order. I made a version of this card in my class today. I just love Bermuda Bay and Elegant Eggplant together with Silver Embossing. I don’t have any of the Party Animals Suite but that wasn’t a problem. The card I chose to case is from page 6. I really liked the layout of the card with the diagonal Happy Birthday. Here’s my version using the Urban Underground Suite. I just love the Hexagon Dynamic Textured Impressions Embossing Folder on Silver Foil Card.